Window functions on Redshift provide new scope for traditional aggregate functions and make complex aggregations faster to perform and simpler to write. Window functions also allow the SQL developer to look across rows and perform inter-row calculations. Possibility of summarization over dynamically shifting view (sequence of rows called window), e.g. 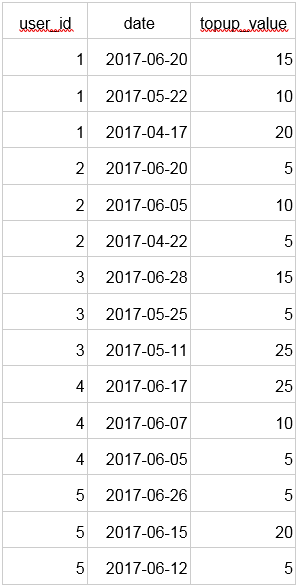 when we want to get an average of last five values for each day. The window is highly customizable, as we will see later. Summarization is produced for each qualifying row, not a group, therefore, we can include any other attribute in the output, which was not possible with aggregate functions unless we group over it. 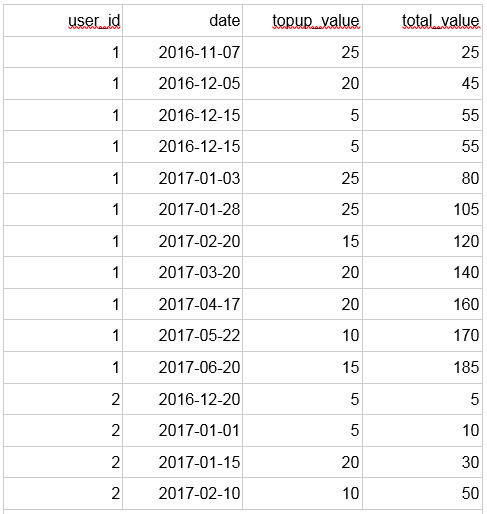 We can compute values over multiple aggregations in one SELECT clause. The latter solution is also faster. It just needs one sequential scan of the table values. The self join requires two scans. 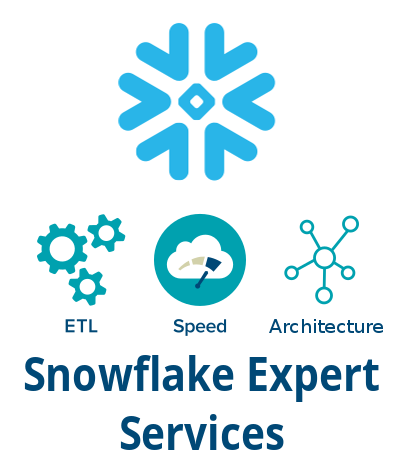 Most relational databases such as Oracle, MS SQL Server, PostgreSQL and Redshift support window functions. MySQL does not. All of the following queries have been tested with PostgeSQL and Redshift. We may use window functions only in the SELECT list or ORDER BY clause. We need to specify both window and function. The function will be applied to the window. With the PARTITION BY clause we define a window or group of rows to perform an aggregation over. We can think of it as a GROUP BY clause equivalent, though the groups will not be distinct in the result set. ORDER BY defines the order of rows in a window. The expression will be passed over to the function in the same order. We will explain these functions in the following examples. Let’s introduce some problems and demonstrate how window functions can be helpful. We will work with the following dataset: topups.tsv. First, we create a table of top-ups. Every record represents an event of a user topping up a credit of a specified amount on a specified day. We load the data from the file into Redshift. 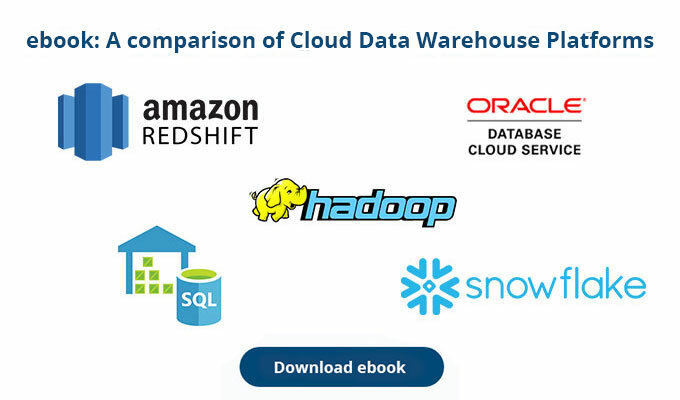 When using Redshift, all files have to be located in one of the Amazon storage services. The following piece of code loads a file from S3 storage using the IAM role. Now let’s demonstrate the solution using window functions. Same output for both queries. The latter approach is simpler, more elegant, and performs better. We can check that all top-ups done in the same month have the same average. Notice that we used ORDER BY, which is completely independent of the ORDER BY that is in the OVER clause. What if we want to compute a sum of credits, that a user paid so far for each top-up? It is called a cumulative or running sum and aggregate functions are not helpful in this case. We would need the groups to be all rows with the earlier date than the current, while GROUP BY can aggregate only by the same date. 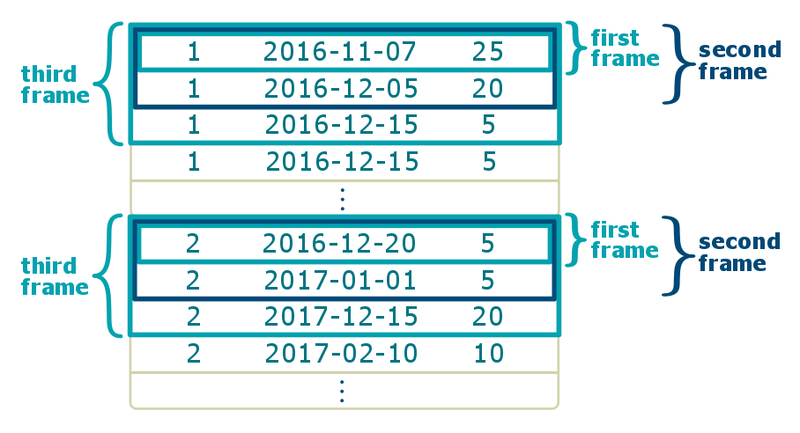 where frame_start can be either UNBOUNDED PRECEDING to start from the first row or CURRENT ROW to start at the current row. Similarly frame_end can be either CURRENT ROW to end at the current row or UNBOUNDED FOLLOWING to end at the last row of the partition. 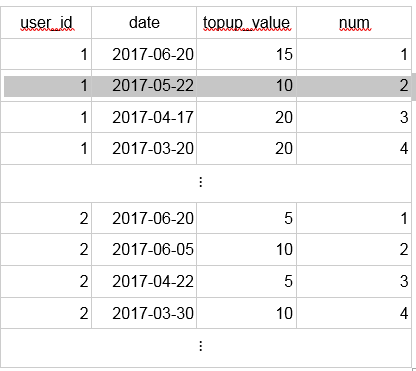 Instead of ROWS we can use RANGE to define frame over values instead of rows, however, it is not fully implemented by Redshift or PostgreSQL. Of course, framing respects the partitions. Let’s see the solution. Now we can read, that e.g. the first user paid €140 by the date 2017-03-20. The task is to find the three most recent top-ups per user. To achieve it, we will use window function row_number(), which assigns a sequence number to the rows in the window. Each window, as per defined key (below user_id) is being treated separately, having its own independent sequence. 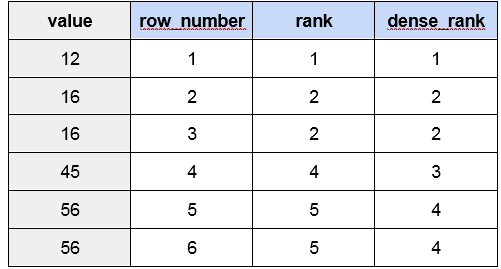 Window functions operate logically after FROM, WHERE, GROUP BY, and HAVING clauses, hence we have to use outer SELECT to filter records with rank less than or equal to three. 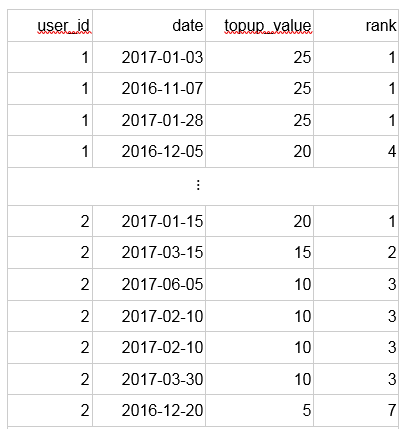 Now let’s compute dates of the three largest top-ups ever per user. 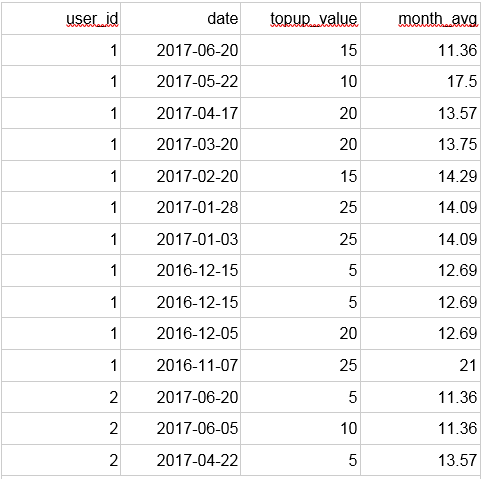 If we used row_number(), the output could miss some of the dates since users can top-up the same amount more than once. Hence, we use a window function rank(), which assigns the same rank to equal values and leaves a gap so that next values match the sequence. For a better understanding of rank(), imagine a competition in which two winners achieve the same highest score, therefore both of them are in the first place. Then the next competitor according to the score is third, not second, so the second place is unoccupied. The rank function evaluates all of the €10 top-ups of the second user with the rank 3, as €10 is his third largest top-up. Sometimes we do not want to leave gaps in the sequence, and still assign the same rank to the equal values. Then, window function dense_rank() is what we are looking for.As we can see, all top-ups of the second user with value 10 are included. In the case of row_number(), only one of the €10 top-ups would have been included. 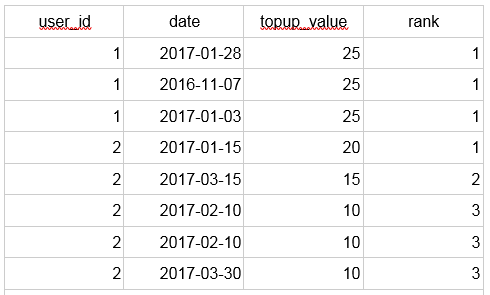 We might want to see differences of top-up values from the previous top-ups. Window function lag(expression, offset) can help us here. It accesses expression on the row prior to the current row by offset. The default offset is 1. Notice that we are ordering by primary key top_up_seq in the window function as well as in the final ordering - we achieve deterministic behaviour for rows with the same user and date. The lag function is not supported by all databases. For example, Teradata database allows using only aggregate functions in the window function clause. 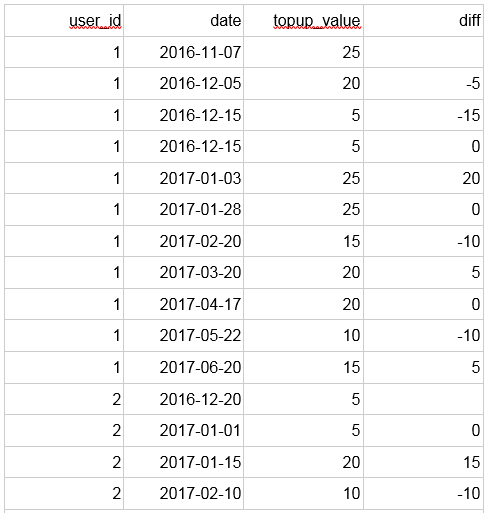 Still, we can use aggregate function max(expression) to achieve the output with differences:The diffs at the earliest top-ups of each user are missing expectedly and the diff values correspond to the difference between current and previous row. Frame definition does not have to always contain the current row. We defined the frame as one row preceding the current. Since the frame is of size one, some other aggregate functions would work as well, e.g. min, avg, sum. The query produces the same output as the version with lag.